Don't fight the crowds along the shore line! 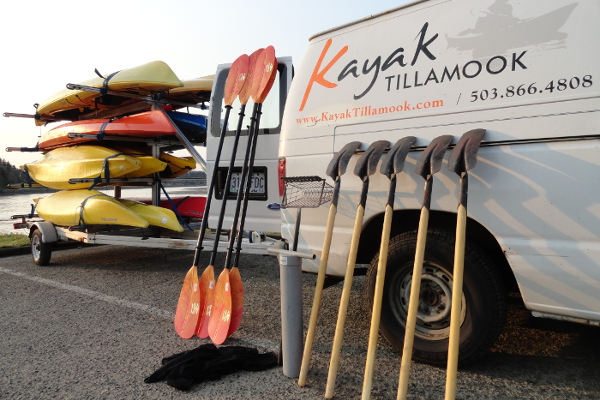 Book a kayak clamming excursion instead and paddle out to less traveled to have your pick of the day! We offer bay clamming tours in Netarts, Tillamook and Nehalem Bays and schedule these tours on special 'clamming tides' which are among the lowest (negative tides) of the year. 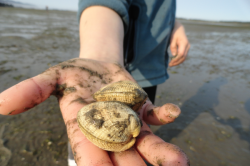 Many species of clams can be found in the tidelands of the Oregon and and the species vary a bit from bay to bay. Varieties include Cockle, Native littleneck, Gaper, Butter, Geoduck, Softshell and Purple Varnish. Legal catch limits varies by species. Come learn how to go clamming on the Oregon Coast, and leave with your catch limit for the evenings dinner! Kayaks, gear and all clamming equipment provided. Be sure to get your Shellfish Licenses and call into the Shellfish Closure Hotline before coming to dig!! Do not forget to bring a container of your choice (with ice) to carry your catch of clams away.